My Finger on the Pulse - Finding Inspiration for "Disco Dogs"
It has been proven, time and again, that I have my finger firmly on the pulse of pop culture. I have the uncanny ability to sense coming trends and design games that are in sync with what the younger generation wants. I won’t go so far as to say that my work is instrumental in shaping those trends, but I will say that if you have a kid and you hate their “wearing a wig backwards” haircut, you can probably blame me. Those of you who know me know that I don’t have very much interaction with other human beings. Most people think that this is for the best. I have a bad habit of talking without a filter which tends to rub most of the population the wrong way. During the course of any given week, I may actually speak to 3 or 4 living people. At the supermarket, I am encouraged to use the self checkout lanes, if I am allowed in the store at all (most supermarkets apparently have a very strict pants requirement that is not in tune with my lifestyle). I am blocked from calling Comcast and other customer service numbers just to chit chat. Given the relative bubble that I live in, one would think that isolation would cause me to be extremely out of touch with anything related to what is actually going on in the world. Not so. It is this very reclusive existence that has led me to my secret. As part of a settlement in a case involving an interaction I had at the previously mentioned supermarket and their strict “you have to wear pants” rule, I am mandated by the court to see a therapist every week. Fortunately, I got to pick the person I get to see, so of course I went for the absolute cheapest person I could find. He’s the rather old, cognitive behavioral guy that we shall just refer to as “Dr. McShrinkington.” I don’t think we are getting anywhere as most of the time he is focused on why I insist on not wearing pants to our sessions and could I please start wearing pants to our sessions. But I’m not going to see Dr. McShrinkington for the therapy. I’m going there for the magazines. I’m not sure where he gets this magazine and, as I said, he seems more focused on my lack of pants than my questions regarding his reading material source, but the table in his waiting area is loaded with what has to be the greatest source of inspiration and reflection of current events that I have ever found. Here is my secret. 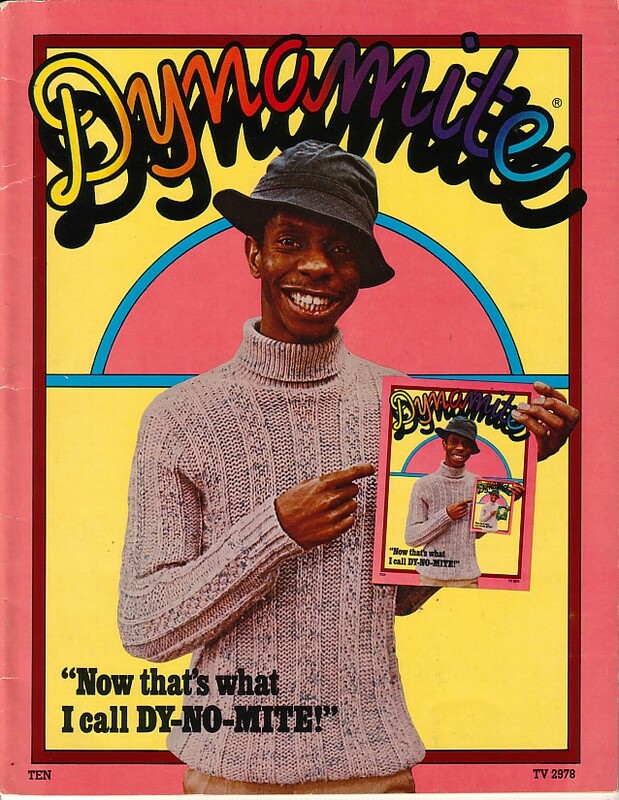 It is “Dynamite” magazine. I haven’t been able to find a place to subscribe to this anywhere, but if you do, do not hesitate. Get this magazine. It is so chock full of well written weekly news, timely events and photos that I want to either hang on my wall or tape into my journal or post on the street that I wrote a letter to their editors suggesting that they change the name of the publication to either “Time,” “NewsWeek” or “The Wall Street Journal.” I never heard back from the editors, but that is neither here nor there. 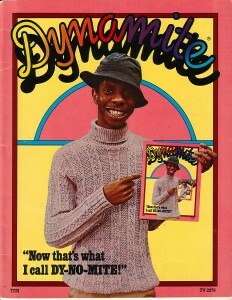 This magazine is where I get all of my news. And, I can tell you a few things with certainty. 1. This disco thing is going to be huge and is not going to go away at anytime in the foreseeable future. 2. A young budding actor named John Travolta (heartthrob!) is going places. 3. Every kid on earth is going to be dressed as a Sweat Hog for Halloween this year. 4. Watch comedian Robin Williams on his new show, “Mork and Mindy.” I predict that his spastic comedy is will tone down slightly in a few years and that we will see him change directions and become the star of more than a few feel good movies, perhaps about a lovable but off the beaten track radio host, nanny, doctor and teacher. All of this will culminate in a failed run for governor of California which will cause him to snap and going on a killing spree that will be both horrific and delightful. Now, this isn’t me talking. This is the writers and editors of “Dynamite” and, let me tell you, their predictions have had a Nostradomusian accuracy so far. There you have it. My well guarded secret. As you find yourself playing “Disco Dogs” later this summer, remember this. Now, it is back to pants-less work for me as I start on my next project. What might that be? A little story that happened a long time ago out in the stars and involves a war. This one is going to be huge.